Which is the resculpt version AR20-610 or BT-014? The AR20-610 is the original "Prime" sculpt offered way back when the Clan's first arrived in the game. The BT-014 is the newer re-sculpt "Prime", and is in line with the other re-sculpted Omnis from that time period. It can also make use of the variant arm bits in the Clan Omni Variant Parts section...and is also complimented by the 20-359 Black Hawk "Nova" H and the BT-013 Black Hawk "Nova" A variants. I have never seen them together, but how does the old one (I have) compare with the re-sculpt? 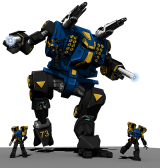 with the DA Black Hawk battlemech? The old one is smaller and less detailed, as is the norm for the original Clan omnis. I can when I get home. Resculpt on the left, original on the right. 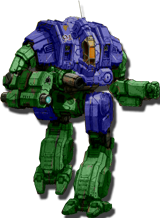 Left is the Black Hawk battlemech and right is the original Nova Omnimech? Quite a size difference for the same thing. I don't have the DA one anymore but it was bigger than the resculpt as well. No, Left is the Nova Resculpt and right is the Nova original sculpt. Okay, I was wondering b/c I did not see the pistons or whatever stuck out on the DA Black Hawk. Yeah, the Dark Age Blackhawk is maybe a little bit smaller than the resculpted Nova, but it's still on the same scale. It's also got highly visible lasers protruding from the torso in addition to the steampunk kibble, and the hands on it are proportionately larger.